Take up to $100 off on your Balikbayan Boxes and up to 30% off on Travel Insurance when you Share your Travel experience or Tips with us. Today’s post comes from Forex Travel’s regular customer, Mr.Borj. A fun loving guy, loves food, travel, life and most especially he loves his wife. 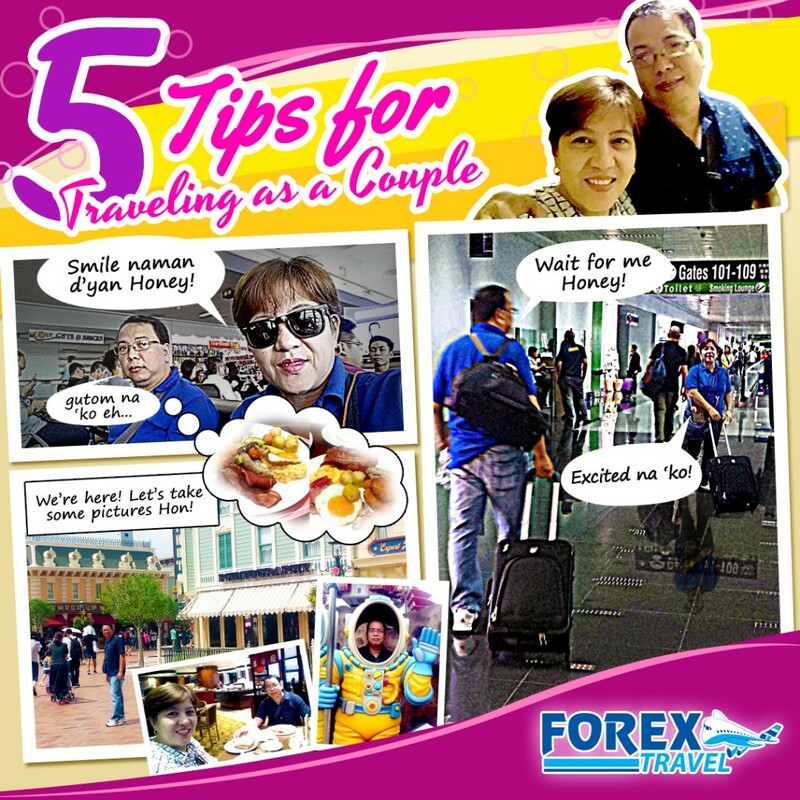 Mr.Borj shares his tips on setting out on a trip together with your loved-one. While on the road sometimes we misinterpret things. Everyone communicate differently and sometimes to reach a person you should communicate in a different way, small changes you say can change the outcome specially for new couples. Communication is the key to any relationship. Couples should learn how to make compromises. Being stubborn will just create frustrations and resentment form both of you. If your partner wants to go somewhere you don;t really feel like, show some love and join in, then next time you really want to do something, your partner will probably do the same for you. Planning if the key, find a way to make both ends meet and make it a win/win for both of you. Some time to be quiet and alone are a required thing for couples. Take some time off for yourselves alone and do whatever you want without being interrupted. This would benefit couples to develop their individuality. Don’t blame each other for mistakes. You’ve forgot your keys or tickets at the hotel room, or missed the flight, these are some things that might happen all the time. Don’t put the blame on the other person even though it might be his fault. This would totally ruin the mood, and the fun. Remember that you are his/her partner and need to work as a team no matter what. This gives you a chance to really enjoy each other specially after a day of travelling. Pamper yourselves the way couples should. Enjoy your companion, share the experiences and the hurdles. Have Fun! If you can survive a trip together you can overcome anything in life! Mr.Borj exclaimed. Share your Forex Travel experience or Tips with us and you’ll get these massive discounts! For every qualified email sent to us, Forex Travellers will get 5 (five) $20 Forex Cargo Vouchers for your Balikbayan Boxes and up to 30% off on your Travel insurance. To Qualify, Travellers should be a Forex Remitter, Forex Cargo or Forex Travel Customer. Compose your travel story or Travel Tips. Include your name, email and phone number. Send your stories to reservations@forextravel.com.au. Promo runs from December 4, 2017 until March 28, 2018. *Winners shall be notified via email or phone, on how to claim their prizes. Remember, For fun-filled tours, accommodations, and the best rates for flights, Book now at Forex Travel! Call us at 0287770060 or email us at reservations@forextravel.com.au . *Stories shall not be published publicly without the consent of the customer. *The vouchers and discount(s) that may be awarded to the eligible winner(s) are not transferable, redeemable for cash or exchangeable for any other prize. *Only 1 (one) $20 Dollar voucher could be used per box. *One entry/story per person/email address shall be accommodated. *Email address provided maybe used for marketing, you may opt-out anytime.